As discussed here, the IRS’s initial interpretation of a new excise tax under Section 4960 of the Internal Revenue Code could catch for-profit employers who set up foundations, trusts, PACs, and other tax-exempt entities off guard. The tax is 21% of certain compensation paid to the top five highest paid employees of the tax-exempt entity. Although the tax was designed to apply for compensation to high-paid executives of tax-exempt entities, an aggregation rule in the IRS’s initial guidance (Notice 2019-9) picks up compensation paid by related employers, even if they are for-profit companies. For example, suppose a for-profit company controls more than 50% of the board of a tax-exempt foundation, and the company’s treasurer also serves as an officer of the foundation. If the foundation is treated as a common law employer of the treasurer (even if the for-profit company is also a common law employer), the CIO could be a covered employee of the foundation. If the treasurer makes more than $1 million—whether in the current year or in the future—the excise tax can be triggered, even if all of the treasurer’s compensation is paid by the for-profit company. A similar issue could arise if the treasurer receives significant separation pay, even if it does not reach the $1 million threshold. The tax would be owed by the for-profit employer and any others who pay the treasurer’s compensation. The deadline for submitting comments to the IRS is April 2nd. Employers who are affected by the rule’s broad net should consider submitting comments (and we can help). The First Circuit held that a plaintiff failed to timely exhaust her administrative remedies under a long-term disability plan because the plan’s 180-day time limit for submitting appeals commenced on the date the plaintiff received notice of the decision that it was going to terminate her long-term disability benefits, not the actual date her benefits were terminated. In so ruling, the Court rejected plaintiff’s argument that the doctrine of substantial compliance and the state’s notice-prejudice rule somehow excused her late-filed appeal. The Court first concluded that the doctrine of substantial compliance, which is sometimes used by a plan administrator to excuse a failure to comply perfectly with ERISA’s notice requirements, could not be used by the plaintiff to excuse her late filing because such an expansion of the doctrine would render it “effectively impossible” for plan administrators to enforce administrative deadlines. The Court also concluded that the plaintiff could not invoke the state’s common law notice-prejudice rule, which requires an insurer to show that it was prejudiced by an untimely notice of appeal in order to deny certain types of claims, because doing so would undercut the policy purposes behind the exhaustion requirement. The case is Fortier v. Hartford Life & Accident Ins. Co., No. 18-1752, 2019 WL 697989 (1st Cir. Feb. 20, 2019). One de-risking tool for employers with defined benefit pension liabilities is to allow participants to receive lump-sum distributions. Although lump sums result in a short-term cash drain, they reduce the plan’s long-term liability—reducing the sponsor’s exposure to contribution volatility. Over the last several years, there has been a question whether lump-sum cashouts may be offered to retirees who are already receiving annuities. Ironically, the concern was based on the IRS’s minimum required distribution rules. Although the purpose of minimum required distributions is to force participants to take their money, the rules prohibit an increase to the payment amount after payments start, subject to limited exceptions. The concern is that a lump-sum cashout could be a prohibited increase to the payment amount. In 2012, the IRS issued two Private Letter Rulings that said a cashout would not be prohibited if (1) cashouts are available only during a limited window and (2) annuitants did not previously have a right to cash out annuities in pay status. The IRS reasoned that, under those circumstances, the increase to the payment amount is caused by an amendment to increase benefits, which is one of the limited circumstances when an increase to the payment amount is permitted. The IRS’s conclusion was consistent with the underlying policy of minimum required distributions: if the annuity in place will pay out fast enough, cashing out must be okay because it results in payment being made even faster. In the time since, the IRS never issued the intended regulation, and the project was eventually removed from the Treasury Department’s Priority Guidance Plan. On March 6, 2019, in [Notice 2019-18] the IRS announced that it no longer intends to amend the minimum required distribution regulation. Until further notice, the IRS will not assert that a window to cash out annuities in pay status violates the minimum required distribution rules. 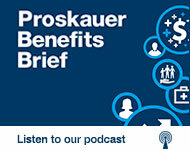 Read the full post on Proskauer’s Class and Collective Actions blog. In Notice 2008-59, the IRS provided certain limited exceptions to its previously stated general position that employers may not recoup any portion of the employer’s contribution to an HSA. Specifically, Notice 2008-59 provided that an employer may recover amounts that it contributes to an HSA account if: (i) the employee for whom the contribution was made was never eligible for an HSA contribution, provided the contribution is returned by the end of the tax year for which it was contributed, or (ii) the employer contributed an amount to the employee’s HSA in excess of the maximum amount permitted under the Internal Revenue Code due to an error. The IRS has stated that employers generally cannot recover amounts from an HSA other than for the two reasons described in Notice 2008-59. In response to a request for additional guidance relating to the ability of employer’s to recover mistaken contributions to HSAs, the IRS recently released Information Letter 2018-0033. The Information Letter clarifies that Notice 2008-59 was not meant to provide an exhaustive list of situations in which employers could recover contributions to an HSA that were made as a result of the employer’s (or its provider’s) administrative errors. Rather, if there is “clear documentary evidence” that demonstrates an administrative error, the employer may request a return of contributions under other circumstances to the extent necessary to correct the error. An amount is withheld and deposited in an employee’s HSA for a pay period that exceeds the amount shown on the employee’s HSA salary reduction election. Because the Information Letter list is intended to provide examples of correctable errors, there are presumably other situations where a return of contributions from an employee’s HSA may be warranted if an administrative error can be clearly demonstrated. In any case, where a corrective action is to be taken, an employer should make sure to maintain documentation to support its conclusion that a mistaken contribution has occurred as the result of an administrative error. An “information letter” is used by the IRS to provide a general statement of well-defined law without applying it to a specific set of facts and is given in response to requests for general information by taxpayers or by Congress. A federal district court in Illinois held that participants in a multiemployer pension plan failed to plausibly allege that plan fiduciaries retaliated against them in violation of ERISA § 510 by refusing to consider their employer’s offer to settle its withdrawal liability to the plan. In lieu of paying withdrawal liability, the employer offered to create a new plan that assumed the former plan’s obligations. After the plan fiduciaries rejected the proposal, the participants filed suit, alleging that the refusal to negotiate or even consider the employer’s proposal constituted a breach of fiduciary duty. The plan fiduciaries then informed the employer that they would “either negotiate or litigate but not both.” The participants thereafter amended their complaint to allege that the plan fiduciaries’ position violated Section 510, claiming that the plan fiduciaries’ position was motivated by the participants’ initial decision to file suit. The district court dismissed the participants’ claim as implausible, pointing to the participants’ admission that the plan fiduciaries refused to consider the employer’s proposal both before and after the participants filed suit. The court also expressed skepticism that the participants could assert a viable Section 510 claim against plan fiduciaries for “failing to do something [they] never had any legal obligation to do in the first place”—that is, accept the employer’s proposal to settle its withdrawal liability. The case is Campbell v. Whobrey, 2019 WL 184056 (N.D. Ill. Jan. 14, 2019).